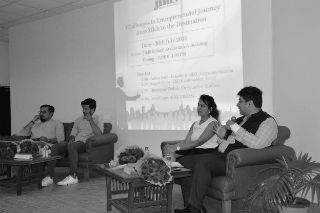 An interactive session was organised on “Challenges in Entrepreneurial Journey from Zilch to the Destination” on 30th July, 2016 for the students of PGDM. 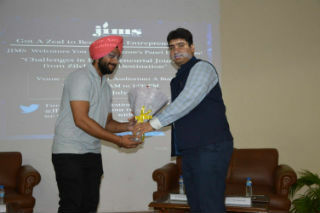 JIMS organized Panel Discussion by Mr. Ankur Sethi, Founder & C.E.O Corporate Shiksha, Mr. Akansh Sinha, C.E.O & Cofounder Servx, and Mr. Himanshu Pathak, Co-Founder, Globox. 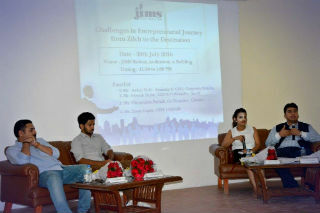 The session started with the brief introduction of panellists and how they started their venture. 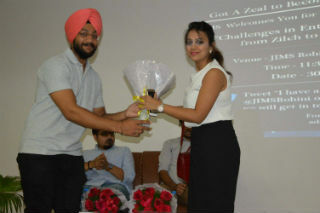 Ms. Divya Gupta, C.E.O Udgam from JIMS started the discussion with question answer round, which covered the mind-set of the entrepreneurs, their working style and problems faced by them. 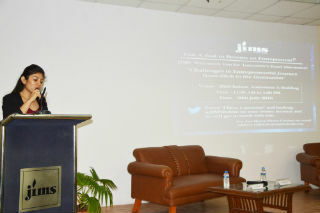 Panellist said – “Speak even if you make mistakes” because without experiencing, one could never learn one’s potentials. EARLY START is good because pressure is LEAST. They also discussed about functioning of corporate culture and how your colleagues feel when you get promotions and that is the big achievement for you at that time. But, if one thinks beyond that then it means he has the quality of an Entrepreneur. 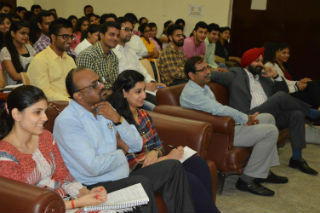 The guest entertained the questions of students and also discussed with examples through which students could get more clarity.